Research shows a link between the size of your vocabulary and the level of your career success. Expand your word power starting today! Unfortunately, your boss, colleagues and clients judge your intelligence by the words you use. Stop! Don't lose a business deal by misusing any of these top 155 vocabulary words for Business English. First edition. July 6, 2018.
Business English professionals know their strengths and weaknesses. Unfortunately, a strong vocabulary is a persistent problem for many students of English (and native speakers!). Rightly or wrongly, you know your boss, colleagues and clients judge your intelligence and competence based on your vocabulary. 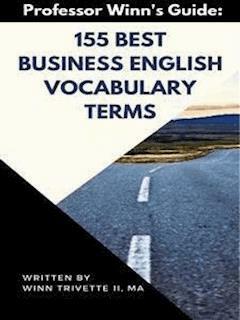 155 Best Business English Vocabulary Terms was written to quickly and easily give you a broader and richer vocabulary. Business English professionals use a sophisticated vocabulary at the office! They are prepared to use le mot juste (the right word) at the right moment. Moreover, research confirms that your income and vocabulary size are correlated. Increasing your word power is an investment in your future career success. Get started today to increase your word knowledge and business success at the same time. Good luck expanding your English vocabulary! p.s. Please consider 1-on-1 online lessons with Professor Winn to improve your (Business) English, write English better, or prepare for the IELTS or TOEFL. 155 Best Business English Vocabulary Terms will help you not only increase your professional word power, but also allow you to use English confidently in a variety of contexts. This book is designed for easy self-study. Each lesson can be completed in a single sitting, approximately 20 minutes. The guide is a perfect companion to your English studies in the classroom. Each lesson represents a field of expertise in Business English. Ten keywords drawn from the field begin each lesson. These words are defined and relative parts of speech and usage are provided. You get two special sections. First, use the bonus section below “10 Tips to Successfully Grow Your Word Power.” These are tips drawn from my years of experience teaching Business English to students. Second, enjoy the extra five (5) bonus words to help you expand your word power even more! Business English professionals are always prepared to thrive in the global business arena. 155 Best Business English Vocabulary Terms is another tool for you to achieve the personal and career success you seek – and deserve! Read many different sources and find thousands of new words and grammar patterns. Build a stronger vocabulary word by word and day by day. Practice routinely. Write all words, definitions, synonym, antonym, and related words. Review your new words every week. Check out quizlet.com to make your own flashcards. Learn new words in context. Research shows most words are learned from context. Copy the sentence or short part of the paragraph into your notebook where you found the word.
. Connect your new words with pictures or with other words, events, professions, etc. Make sure you pronounce the word correctly. Visit an online dictionary and usually you have the opportunity to click and listen to the pronunciation of the word. Find out how much know so far. Measure your progress and make adjustments to your study routine. Play word games like Boggle or Scrabble online. Even consider crossword puzzle. Any word game forces you to rely on your recent study of words. You may even learn new ones! Building your vocabulary is a lifelong practice. Be curious about words and how you use them. A good vocabulary will help you obtain both personal and career goals!